Norwegian investor Scatec Group founded Scatec Solar (SSO) in 2007 with the vision of providing “competitive energy for a better future”. Later, Japanese trading house Itochu Corporation invested in the company. 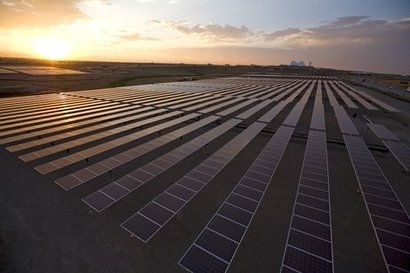 The solar energy provider has since installed around 270MW of photovoltaic (PV) power systems in various countries and accumulated a pipeline of 2.3GW across Europe, Africa, the U.S. and Japan. SSO was the first company to develop a megawatt-sized project in Germany, as well as the world’s first triple ISO-certified solar development and EPC company. Driven to always grow and improve, it has held the world record for the largest PV power plant three times. But it’s not all about impressing people; one of SSO’s central aims is to make solar power affordable to people worldwide. Chief executive Raymond Carlsen says the company’s objective is: “to establish solar PV as a sustainable and lucrative future source of energy all over the world”, and its track record indicates that it has made an excellent start in fulfilling this mission. SSO is currently building its largest project to date at Kalkbult, in the Northern Cape of South Africa. The South African Department of Energy (DoE) awarded the 75MW project to SSO in the first round of the South African Renewable Energy Independent Power Producer Program (REIPPP) in November. “We see the future-oriented South African renewable energy initiative as a great opportunity to demonstrate the true potential of solar energy as a source for large-scale electricity production both in Africa, as well as other areas in the world where electricity is in great demand and the solar irradiation is favourable,” comments Carlsen. The 75MW project will be one of the largest in South Africa, covering an area of 105 hectares and producing more than 145 million kilowatt-hours (kWh) annually, enough to cover the electricity demand of 35,000 South African households. Feeding power into the local grid network, through a 20-year Power Purchase Agreement with local utility company Eskom, the plant represents the elimination of 125,000 tonnes of carbon dioxide emissions per year. “The Kalkbult project will be important simply as an additional source of electricity which is in great demand in SA,” says Carlsen. The Kalkbult PV power plant is scheduled to enter commercial operation towards the end of this year. SSO’s Kalkbult, project is one of the latest in a long line of achievements, including some projects it has developed, some it has built and some it still owns and operates. For each of these project stages, SSO has a different business unit: these are Scatec Solar Development, Scatec Solar Solutions and Scatec Solar Production. Scatec Solar Development takes promising sites and transforms them into fully developed projects, generally over a period of one to two years. SSO will then either sell the developed project to external investors, or build the facilities through its in-house EPC division Scatec Solar Solutions. Comprising experienced PV system designers, engineers, project managers, site managers and supply chain professionals, Scatec Solar Solutions delivers turnkey construction for both SSO and external investors. The final business unit, Scatec Solar Production, acts as an independent power producer (IPP) and manages the PV system assets directly owned by SSO. The company currently holds 20MW of PV systems on its own books. SSO’s track record shows it has achieved a great deal in a relatively short time. The African Business Journal talked with Carlsen and he says the main reason behind Scatec’s success is its ability to quickly adapt its strategy to the changing market and become a “first mover” where new opportunities have appeared. The company initially identified these markets in Europe – countries including France, Germany and the Czech Republic – and South Africa. In these markets, SSO built strong networks of regional partners so that it could utilise local knowledge and skillsets. The benefits of this strategy have become especially clear in South Africa, says Carlsen. “[In SA] we were prepared to provide high-quality projects in the first two rounds of the [REIPPP] tender process because we had moved in early, had partnerships in place, had development activities and projects ready to build,” he says. SSO’s quick movement into new markets won it many valuable opportunities; however, to make the most of those opportunities, the company relied upon its international solar energy knowledge hub. “[This enabled] us to back our business development activities with the best solar experience in the industry, in combination with superb project execution skills,” Carlsen adds. Over the next 12 months, SSO will continue to develop new projects in targeted markets – including Europe, the US, Sub-Sahara, Middle East and Japan – where there is high solar irradiation and high return on investments. The company’s work in South Africa will continue with the completion of the second round of the REIPPP bidding process in March/April. SSO has big ambitions for 2013, but even bigger ones for the long-term. Carlsen predicts that in 10 years’ time, SSO will have brought solar power to most geographies in the world, possibly with the exception of the company’s ‘home country’ Norway.